~ THE LAZY VEGAN ~ HOME OF PACO & LUIGI AND FRIENDS: A Visit to the Bunny Playground, the Foreman's Birthday and More at the Lazy Vegan! 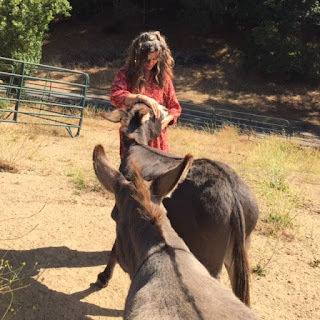 A Visit to the Bunny Playground, the Foreman's Birthday and More at the Lazy Vegan! It's been a over a week since the day of the Big Bunny Bite (when Rufus bit Wasabi) and things are slowly getting back to normal with the bunnies although there have been a few minor squabbles. Sadly, fostering another rabbit probably will be off the table for a long time and might never be able to happen again - bunnies are so complex in this way! 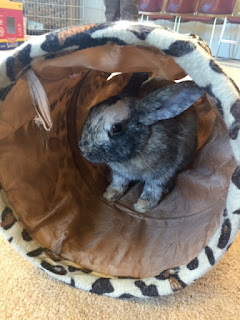 I was able to visit Louie several times at Sonoma Humane this past week and he's such a love and settled right in and thoroughly enjoyed the Bunny Playground, where he actually groomed the troublemaker bun of the group! I hope he goes to a great home where he can be bonded with a bunny friend - he's such an easy-going little guy that I'm sure he'll find a partner. And in the big news of the week, the foreman had a birthday! He celebrated it by working a long day, with a break for lunch at our favorite vegan restaurant! So wonderful to see some snuggling again. Cute video above of Rufus coming down the stairs! I got to sit in on a presentation from Animal Place sanctuary this week at Forget Me Not farm - they talked about factory farmed hens and brought along forty hens that will be available for adoption! And I got to visit Wilbur the pig...short video below! Birthday fun for the foreman! So much fun to help out at the Bunny Playground. 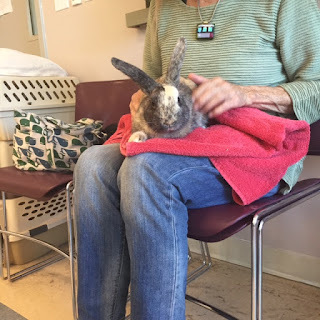 I haven't been there in a while and it's such a hoot to see the shelter buns hop around while music plays and prospective adopters come visit. This is the spot Rufus hangs out in for a few hours during the afternoon...so cute! (A little out of order)...Let the games begin! The shelter buns prepare to be let out of their carriers (there were more than the four pictured here). Little Louie and Karin, the woman who first spotted him while on a walk at the Laguna. Alvin, a bit of a troublemaker. Shamus - Louie's roomie - went on a date and OMG, it worked - so he got adopted right then and there and went home with a visiting bun from San Francisco! Amazing to see Louie groom Alvin! A huge relief to see some friendly grooming going on. And playtime and nap time. Rufus is so helpful around the house! Welcome to the Lazy Vegan Bunny Hotel!